Starring: John Goodman, Rhea Perlman, Jay Leno, Walter Cronkite, Julia Child, and Martin Short. Description: Dr. Neweye travels back to the age of the dinosaurs to bring back four specimen, given human level intelligence to help fulfil the wishes of children all over the world. We follow the adventures of the 4 dinosaurs through the eyes of the T-Rex known as Rex. This is from the era where audiences were reminded that all good animation is not done solely by the Disney corporation. Unfortunately, this is not the greatest example of another company infringing on the mouses territory. 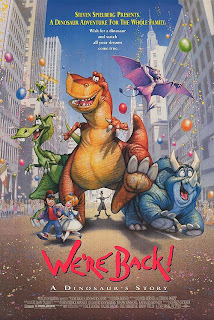 As a kid, I utterly adored this movie. It had some of my favourite things in fiction, even at the time: Time Travel, Dinosaurs and The Circus! To me this movie was on a pedestal far beyond the reach of mere mortals and nothing could possibly reach it's heights! So yeah, you could say that it was with rose-coloured glasses that I recently decided to introduce Miki to it and popped it in the VCR. Did I get disappointed? Well, no. I actually got surprised at how much I remembered from this movie, but as an adult I've heard some pretty less than stellar things about this instant can of nostalgia of mine and it's rating on IMDB threw me off. So rewatching this also had the purpose of "checking" if I was an idiotic kid all those years ago. You know what? Sure, I was kinda stupid but the movie definitely had things going for it. The things I remember the most fondly from the movie were actually the things that people have poked fun of the most, one of these things were the clown, for some reason nobody seems to like the clown. Now I occasionally do comic strips myself and I actually consider the clown in this movie to be one of my major comedic influences so nobody liking the clown were, to say the least, worrying. Now as I said, I certainly was a stupid kid and this text is not supposed to be me blindly defending every aspect of the movie. Yes, it certainly has problems. Most of the things aren't explained and you just kinda have to sit down shut up and see how much you can take in. As an example you never fully get explained the whole time travel deal, why the kids don't seem to mind the presence of dinosaurs in present time (in the movie referred to as "The Middle-Future"), What the deal with the circus owner is (though "he's crazy" is given as a kinda thin explanation) and why there's an alien present. This is based on a childrens book (which I haven't read) which I should hope gives more of an explanation as to what in the world is going on. In any case I certainly loved to revisit this and I'll be glad to do so again in the future.